We come together, acquaintances and strangers; young and old to protect our surroundings and to ensure a beautifully green and sunny homeland. All this is not the oath of the Green Earth Volunteers, but these sentiments flow from all our hearts. The Green Earth Volunteer Organisation is very young, for it was only towards the end of 1996 that we took this name. Our first green activity, initiated by a few journalists and scholars, was 'adopting' a tree. At the briefing to launch this activity, we learned that although there has been voluntary tree planting in Beijing for 15 years, many trees languished or even died before reaching maturity because they were not cared for. The work involved for the successful growth of a tree is 30% planting and 70% cultivation. So we gathered -- college students and middle school boys and girls, whole families, all ages from the youngest at 6 years of age to oldsters in their seventies. We named ourselves Green Earth Volunteers. One mother who took along her 6-year-old boy said, "My son doesn't understand what a volunteer is and he looks on all this as a great game. I think that we should get children to appreciate nature through such games and play." An elderly scientist who came with us to adopt a tree viewed such activity in this way: "Environmental protection is a vital issue which should concern all human beings. It's good to start with small things immediately around us. We should leave posterity good living conditions. This is our duty and also our joy." Another speaker pointed out that our environment is borrowed from our descendants. When we return it to them it should be for them a beautiful home. There should be clean water, blue skies and green trees. As a Green Earth Volunteer, you don't have to sign up. The only thing you have to have is a 'green wish'. No matter whether you are young or old, no matter what your educational level, if you want to embrace nature wholeheartedly you can become one of our green earth volunteers. To embrace nature, you have to go out into nature. Bird watching is another of our activities. You might know the names of some birds and know something about them from books or TV, but when you actually see them in the wild and can identify them, it gives you a huge thrill and enjoyment. The state of a bird's habitat is an important pointer to the quality of the environment. Once a species becomes extinct, it is gone forever. However, if a species disappears from a certain area, it can return as long as the environment is improved. No matter whether we are in the city or the countryside, the most numerous wild creatures we see are birds. Protecting wild creatures is protecting the environment, and loving birds is the first step in this that an ordinary volunteer can take. Green Earth Volunteers who have just joined are led by experts. In the past, they took only college biology students out bird watching, but taking out amateurs gives them great pleasure. Bird watching involves much more than admiring beautiful plumage and enjoying bird song. It is more important to be able to identify the various species, to learn how to protect them and to ensure their safe migration to the south in the winter and their safe return to Beijing for breeding each spring. Nowadays, more and more Green Earth Volunteers are joining our bird watching expeditions. On weekends, one can see binocular-toting hikers everywhere, in valleys and along the rivers. Bird watching makes one think. Every year there's a drought here and a flood there; the Changjiang (Yangtse) overflows and the Yellow River dries up. Why do these disasters occur? It is we human beings who are to blame for destroying our environment, and nature takes revenge. The extraction of any species of bird is an irreversible loss. Mankind is beginning to realize this little by little. We hope this awakening will not only save the birds and other living creatures, but also rid us of the false concept of 'conquering nature'. One day, the human race will live in close harmony with other living things again. In foreign countries, it is becoming common for volunteers to act as guides in zoos. Children have a natural affinity for animals, yet many of our children can only name the tiger or the elephant and know nothing of their habitats or that many animals face extinction. We Chinese Green Earth Volunteers also hope to act as guides to visitors in our zoos and botanical gardens throughout our country. When, in Beijing, we put forward our ideas to the authorities, their immediate reaction was: What do you want from us? Further persuasion and sincere acts finally moved the profit-oriented administrators. 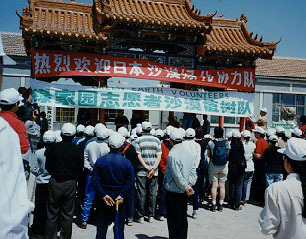 A training class for Green Earth Volunteers was formally set up in the businessmen's Beijing Bird Garden. The first class was listed as "Know Our Friends." The organizers planned for an attendance of 30 people, but a hundred turned up! They were fascinated. A 3-year-old boy was taken along by his grandmother. When he heard the lecturer talking about the killing of the North-east tiger, he cried and called out, "Why did they kill the big tiger? Why did they kill the big tiger?" He kept on asking this question for the rest of the week. His grandmother said that her grandson would never forget this and would never in his life harm a tiger. She hoped that more grandparents would take their grandchildren along to such lectures. The elderly love children and they also love animals. They, too, can be volunteers in the park to urge people to live in harmony with nature. 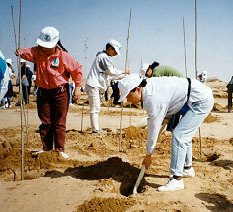 On May 1, 1997, International Labor Day, 108 Green Earth Volunteers planted 1,888 trees in the Engebei Desert of Inner Mongolia. 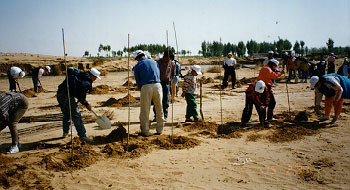 Tree planting teams included compatriots from Hong Kong, Americans, Canadians, French and Japanese. The money for the saplings was donated by small children in Hong Kong, who also created a 'Hope Tree' bearing hundreds of thousands of leaves along with a 'green wish' from the children. Green Earth Volunteers have set up a Green Earth camp. Now, city children learn how to grow vegetables. When some of them used a spade for the first time, they hardly knew which end to use. When they spied the first shoots pushing up from the soil, they jumped up and down and yelled in excitement. To see these children savoring their own vegetables, this green food, is a sight that will stay with one for one's whole life. Green Earth Volunteers is very young. The young like to dream. This year has been named 'The Year for Protecting the White Dolphin'. A White Dolphin exhibition will be held in August at the Beijing Natural History Museum. We are also hoping to organize parties of middle school and primary schoolboys and girls to go to the Changjiang (Yangtse River) the home of the white dolphin. There, they will put up posters urging protection of this rare creature, and letting people know that the white dolphin lives nowhere else in the world but in this great river of China. We also hope that Green Earth Volunteers, especially school students, who have been exposed to some education in environmental concerns, will wear green clothes and go into every park, large and small. There, they will not only do some propaganda about us human beings and nature, but also pick up litter, thus setting an example to awaken people's consciousness and love for nature. Other ideas we have is to have a green 'convertible' roaming the streets screening videotapes of 'Animal World', to mount exhibitions of cartoons dealing with mankind and nature, and to set up training classes for Green Earth Volunteers. May more and more people sing the 'green song' along with us Green Earth Volunteers! We are not rich. We have done very little. All our expenses have been paid for by our volunteers tightening their belts. One retiree even contributed 200 yuan from his savings. When we went tree planting in the desert, most people, who by and large were wage earners, paid their own traveling expenses out of their modest wages. Of course, we try to find ways to save material and act economically. We are proud of this today, and we will continue to uphold this as a principle in the future. We haven't yet been able to establish a bank account, but the consolation of every one of us is that we are uniting more and more people under our green flag which is waving vigorously.